St John’s School in Carlton Hill started as a church school not long after St. John The Evangelist’s Church was built. The church was consecrated 28th January 1840. In 1870 the school was rebuilt on its present site and became The St. John’s National School for Girls, Boys and Infants. In the 1950s it became St. John’s County Primary School (Infants). 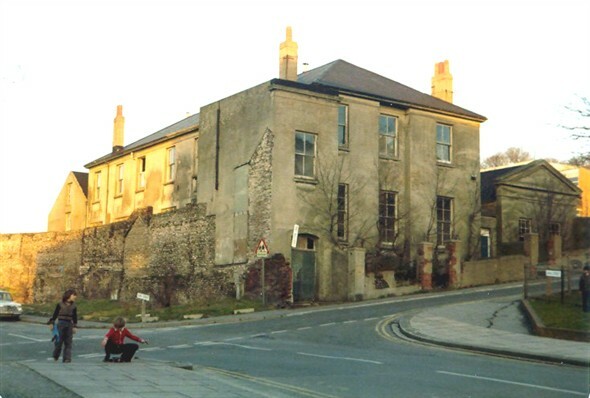 Unfortunately the school succumbed to the wholesale redevelopment of the area in the 1960s, when it was closed. I went to this school when I was in the nursery class we had to go to sleep on little beds they were like camp beds. I’m not sure how old I was. Also we used to have to queue up in the hall a spoon full of orange juice and one of cod liver oil which was horrible. Does anyone else remember this, it was a lady called Miss Yendal who gave it us? I think that was her name. Headmistress in the 40s and 50s was Miss Grout, a portly and aloof but nice lady. A young girl named Sue looked after the nursery kids that took their afternoon nap on canvas camp beds, her class was first on the left as you went through the front door, next class up on the left was I think a Mrs Gardner (or Harding) she looked after the 5 year olds and up. 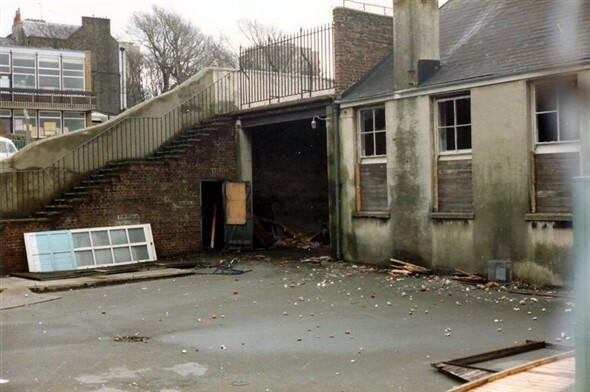 Then the last class on left before the door leading to the playground was Miss Payne’s class, the assembly hall (and dinner hall I think) was on the right as you entered through the front door. I have memories of a sandbox table with a multi-coloured wooden toy windmill which if you reached up inside of it and pulled a string the windmill sails spun round. I went to this school too as did some of my brothers. If I remember correctly, there was a big green entrance door leading to the very uneven red tiled corridor with many classes off of it. I remember having to have a nap on those canvas camp beds too and have to drink a 1/4 pint of full cream milk every day. Joy Panteli (Smith). Yes, I remember that big green door and the milk in the little bottles. They were the good old days. Hi Kathleen, I also remember Miss Yendall, a very kind lady. I suppose she would be classed as a teacher assistant today. Do you remember queing up in the hall once a month to see the “knit lady”? Apart from Miss Payne I cannot remember any other teachers from the infants. I also went to the junior school across the road. The headmaster was Mr Hambridge. Yes I remember all of that and does anybody remember an arithmatic (in what it called in those days) teacher called Miss Bailey? I never forgot her as she smacked my knuckles with a ruler. Carole (Goble). Do you have a brother, or cousin, called Keith? I went to the school too, and distinctly remember the camp beds and cod liver oil. What fun. Then, when I grew in to long flannel trousers, it was acroos the road I was transferred, then on to Queens Park C.S. school. Must have had admirers at all three. Anyone remember me? Very dim and distant memory, must have been nursery class as it was before I was 5 (1960?). I remember the nap on the camp beds and milk but does anyone else remember having iced buns (half)? I retain a fondness for these! The pics above stirred these memories but I also remember the walk through the fruit and veg market, with the horse eating from it’s sack, and the overwhelming smell which, many years later, I discovered was the smell of the nearby brewery. I to went to St John’s School Infants and Juniors. Does anyone remember Mr Barnwell – he was a maths teacher – little short man with glasses. We had him for our last lesson on Friday afternoon. He used to call you to give him a answer, and if you didn’t know it, he would throw the black board duster which was made of wood. I remember the class was right up the top of the school. I went to the junior school across the road from the age of 7 in 1961. Then I moved on to Queen’s Park secondary. Mr Hambidge was the headmaster and his wife also taught part time. They had two young daughters called Nicola and Judith who used to come into the school sometimes. It was a small, happy school, but I remember they used to smack girls on the top of their legs quite often. I can remember a teacher called Mrs Slack who I found quite intimidating. I also remember Mrs Yendel- I think she was the school secretary and she had some connection with St John the Evangelist church in Carlton Hill. We had to attend the church once a week in school time. There was a Sister James from the church and she could often be seen walking around the area in her sombre grey clothes and hat. Every year on May Day, mounds of fresh flowers were delivered to the school, I’m not sure why. We were each allowed to take home a large spray of flowers which was really lovely. I was born in 1954 and here are a few of the names I can remember from St. John’s school, who will be the same sort of age. I may not be entirely correct, but I’ll do my best. Charlie Hardwick, Julie Hardwick, Joan Hardwick, John Virgo, Clive James, Mary Grant, Pauline Dove, Janet Taylor, Linda Oakes, Yvonne Arnold, Elaine Arnold, Grace Hamilton, Arthur Haynes, Peter Grant, Jeanie Bean, Vannessa Whittington. I went to this school before it closed, then up the hill to the new school- after that across the road to St John’s, where Mr Hambridge was headmaster. I seem to remember that the school was connected to the church up the hill, and all the children had to go to church once a week. I have a photo some where when the school had a service in St John’s school hall, I think it was a dedication service for some thing. I attended both infants and junior school from 1945 – 1949. I remember Miss Payne, Miss Grout and Mr Barnwell. There was also a Mr Dunne and Miss Bollom in the junior school. The headmaster was Mr Whitham. Mrs Yeandle was school secretary and my Mum worked in the kitchen for school dinners. I remember Miss Payne allowing us to pull her hair to prove it was not a wig and I still have my school report with her name on it. But I have spoken of this in other messages. I lived in White Street during this time. My Dad worked at Welfares Greengrocers on the corner of Blaker St/Edward St. He is still alive and will be 100 in November. The vicar at St Johns Church was the Rev Eastham, who later became vicar of St Giles, Horsted Keynes. The Rev Franklin took over from him. I remember the camp beds in the nursery school, which I believe were put in place, due to the disturbed nights we got during the war from night bombing, when we had to rush to the shelters. I hope this brings back many memories for those who were around in those years. I also hope that my memories will also be of help to many other readers of this wonderful website. I have just come upon this site and it has jogged so many memories. I went to St John’s Infants and Juniors from 1949 to 1957. I lived in Milner flats – at that time most of the children in Milner and Kingswood and surrounding area went to that school. I didn’t recognise any of the faces in the photos (but that was 60 years ago) but I remember the names and many more like Terry Lever, Keith Goble. Lee O’donal, Teddy Denyer, Tommy Bud and many more. I went to both the infants & junior schools. I remember having to sleep in the afternoons on the little beds. I also remember being able to buy a current bun for a penny or an iced bun for two pennies at play time. I can only remember Mr Barnwell. Some of the girls in my class were: Linda Pont, Carol Millington, Susan Swaysland and, Mable ?. My parents had a clothing shop in George Street. The years were up ’till 1957 when we moved to London – oh happy memories!! I have remembered some other names: Josie Roach and Susan Caine, and Mabel’s surname was Poor. I can’t remember the boys’ names. Ted Ellingford – I think I used to go to this school. 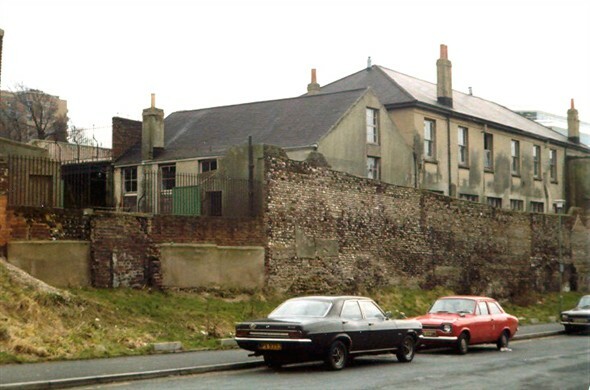 I lived in Newhaven Street until 1959. Would this be the school? I was known as Brian Roffey in those days. Would be nice if anyone remembers me. I remember the air raid shelter, and the iced buns. Hi to any one who might be reading this page. I don’t seem to be having much luck regarding me and my family when we lived at Newhaven St in the 1950s. Our family surname then was Roffey. We lived at no 19, with the brewery behind us. I really would love to know, if there is anyone out there that may remember us. My two sisters were Lorraine and Barbara. Mum was Eva, Joyce, and father’s name was Robert(BOB). I also can’t remember the name of the school that I went to – I think it may have been St John’s, Carlton Hill, but I’m not sure. The years would have been maybe 1954/1959, which is when we all moved to Middlesex. I truly hope that someone out there can help me. Many thanks. My name was Jean Baker – I went to St. John’s infants and junior school. There is a photo of me in the 1950 school photo, age 6 – my friends Joan and John Noble were twins – and Pat Washer too who lived in Milner flats were also in my class. 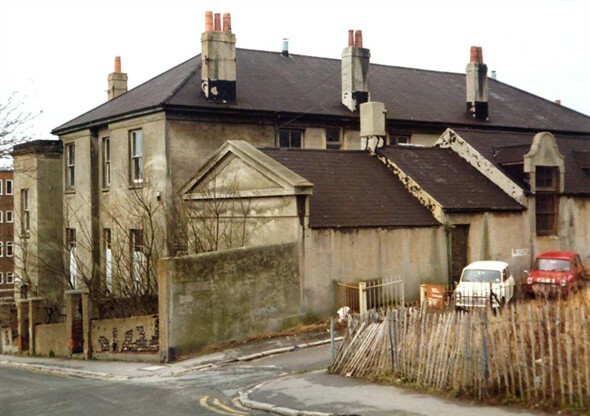 I lived 5 Richmond Hill (right opposite the school) the were prefabs built by the German prisoners of war – they no longer exist and a kindergarten is up in its place. I had Mr Barnwell in my last year and a signed photo of him. I would love to hear from anyone of that class. I’m sure that was Sussex Street school. It looks a lot like I remember it back in the late ’50s, but it was a long time ago!